BTEC Art & Design students at The Sixth Form College, Solihull got an insight into illustration as a career when a representative from Birmingham City University visited last week. Ian Dodds is a Lecturer in Illustration and a former member of staff of the College. He returned to the College to give a presentation to a group of Visual Arts students on our BTEC Extended Diploma in Art & Design course. Ian discussed his work at the university, as well as his freelance illustration work for newspapers, magazines and book covers. Much of Ian’s work involves Photoshop to produce his illustrations graphically and this is software available to our students at College. The talk includes an explanation of the way freelance illustration work is done, from the brief arriving from a client, the creative process they undertake, all the way through to the final design. Examples of the work he has done brought the subject matter to life for the students. 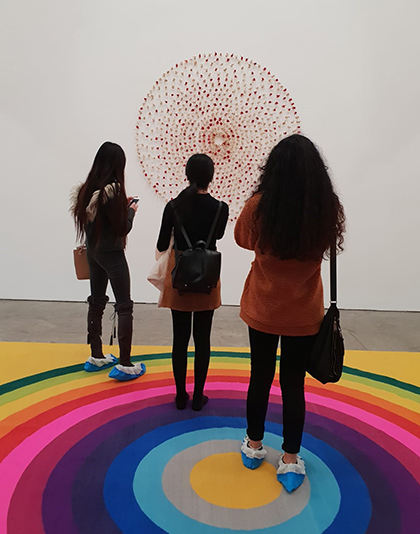 BTEC students, as well as first years on the A level Graphics course, also visited the Ikon Gallery in Birmingham recently to see the inspiring artwork on display there too. Both the fieldtrip and the visiting speaker will influence the students in their own original artwork that they must produce as part of their courses. The Visual Arts department at the College includes A levels in Fine Art, Graphics and Photography, as well as a BTEC Extended Diploma in Art & Design. Students who opt for the A level route often progress onto Foundation Art courses when they finish College, while BTEC students are able to start an undergraduate degree immediately after their course. We have a particularly good track record of placing students at Birmingham City University.